In the 1940s and early 1950s, common bedbugs had become almost extinct. They were easily controlled in households by spraying the popular pesticide DDT. Since the government banned the use of DDT, bedbug infestations have resurged. are small wingless insects ranging in sizes from barely visible up to a quarter inch long. They vary in color from milky white to dark red or brown. Since they are blood-sucking parasites, their color varies depending on whether or not they have fed recently. They have now become a problem in homes, hotels, cruise ships, and anywhere else people sleep. We commonly think of them as being intrinsic to slum dwellings and other poorly maintained living quarters, but that is inaccurate. They are known to flourish in some of the country’s most upscale hotels and resorts. Entomologists believe the increase in international travel, especially from developing countries, and the lack of effective pesticides are to blame for the exponential spread of the pests. Do they pose a health hazard? The answer is somewhat yes and no. Healthcare professionals say they are not known to transmit any infectious agents, but their bites can trigger allergic reactions that manifest in whelps and rash that resemble evidence of other insect bites, such as mosquitoes and fleas. Where do I find them and how do I get rid of them? Bedbugs go where they can find humans and other animals and hide near their sleeping areas. While the host is asleep, the insects insert their microscopic probe and ingest a small amount of blood, much the same as a mosquito would. After feeding, they return to crevices and tight hiding places in and around the sleeping area. Close inspection of mattresses, box springs, and cracks and crevices around the room is necessary. If quarters are severely infested, pest control specialists should be brought in to eliminate them safely. Applications of over-the-counter pesticides are usually only minimally effective at best. Since summer is here and school is out, many families head for the beach or the mountains. 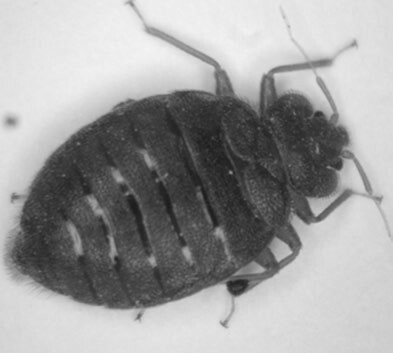 Those who vacation in hotels, cabins, or other public accommodations are subjected to whatever critters those who have stayed before them have left, including bedbugs. Therefore, it is advisable to make a quick check of the vacation sleeping area and thoroughly wash all clothing and other items before returning them to the home.